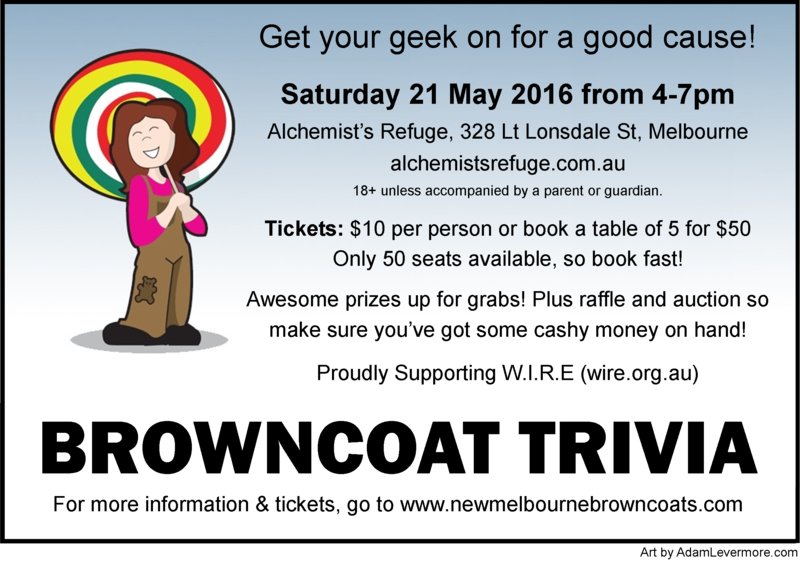 New Melbourne Browncoats, Inc. | We’re having a Browncoat Trivia Event for Charity! Recent donations to charity We’re on the hunt for donations of shiny swag for CSTS! We’re having a Browncoat Trivia Event for Charity! Get your geek on for a good cause! Don’t know much about Firefly/Serenity? That’s ok, there are rounds on pop culture too! And all the proceeds support W.I.R.E (Women’s Information and Referral Exchange). So find a crew or be a mercenary (we’ll assign you to crews who are short on bodies) and join us as we head out to the black. Where: Alchemist’s Refuge, 328 Little Lonsdale St, Melbourne (http://www.alchemistsrefuge.com.au/). Venue is licensed, so patrons must be 18+ unless accompanied by a parent or guardian – ID will be checked. Tickets: $10 per person, or book at a table of 5 for $50. Only 50 seats available, so book fast! Ticket sales close on Friday 20 May 2016 (unless sold out earlier). Round 3 – Firefly & Serenity Feature Round! Prizes will be awarded for first and second place, and there’ll be a consolation prize for the team who comes in last. We’ll also be holding a raffle and mini-auction, so make sure you’ve got some cashy money on hand!